Ah, refreshments are so important, be it hot or cold outside. 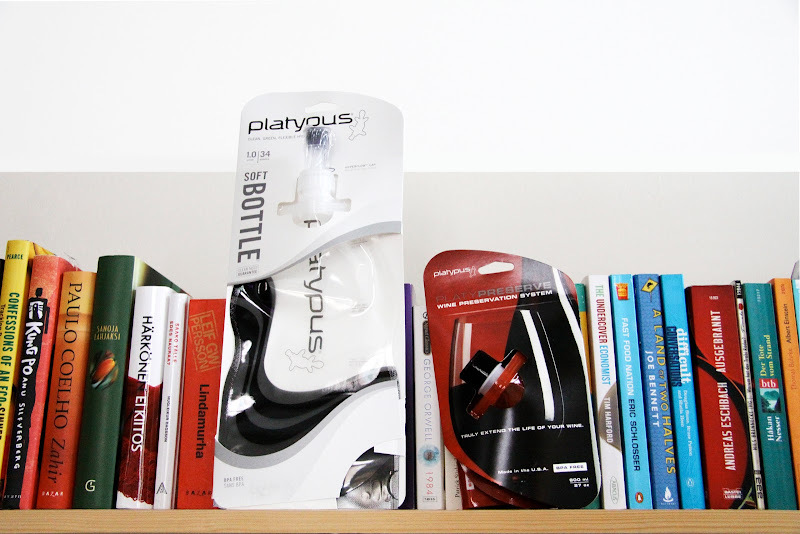 Useful if you don't want to carry a heavy bottle are collapsible bottles like the Platypus Softbottle. The new version comes in different colours and promises to spice up your life, while the markings on the back inform you how much liquid you still have - very useful if you cook food and need to measure exact amounts of water but don't have any other means. Obviously the bottles are BPA free and of the same great quality you know from Platypus. And for the wine lovers, who like to take a good drop on the trail to enjoy by the fire (like Xavier and me on our last trip) Platypus now offers the PlatyPreserve, which will protect your fine drop on the trail till you want to enjoy it. On Friday the 22nd of January 2010 at 12.00 o'clock Finnish time the raffle closes and I will pick the winner with the help of Random.org and will send the two Platys the following Monday. I send worldwide, from Fiji (where Roman currently tries to packraft) to Russia, so try your luck and get yourself a Platypus and a PlatyPreserve for 2010! If you belong to the fraction who can't wait or doesn't try its luck, check out Bergzeit for one.